AK47, an active artist involved in underground and alternative sub-culture circuits since the 1980s, is back in London for a solo show of commercial works at the Maurice Einhardt Neu gallery. 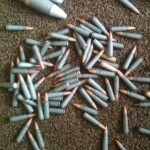 You may have come across AK47 bullets around the street of East London. If you have not, take a look at the video we have included below. AK47 the artist ‘Bullets Straight From The Heart’ from Art kieda on Vimeo. “Bullets Straight from the Heart” will comprises a series of heart-shaped works with bullets sandwiched between two sheets of perspex, their tip piercing through the front sheet, spell out words and phrases such as LOVE, HATE, KISS ME. These dictums or mandates readily reveal themselves when the viewer stands immediately in front of an individual piece. Direct exchange ensues — the back perspex is mirrored and reflects back to us our own image, the bullets targeting head or chest depending on our individual height. Until this point, when viewed at an angle, the bullets appear like batteries of missiles ready to launch. ‘Love Hearts’ — the tablet-shaped fruit-flavoured sweets, that feature prominently in the artist’s childhood memories, come together in Bullets Straight from the Heart, with another potent childhood memory: playing with guns. The snappy love-related messages of 1970s pastel-coloured confectionary are rehashed and perforated in the juxtaposition of these two referents. Interaction continues also at the point of sale, with the smaller works in the show flat-packed in pizza boxes ready for self-assembly. When – The exhibition opens to the public daily on Thursday 7th November and runs until 19th November 2013 from 12 noon – 7 pm FREE ENTRY. This man will go far, oh yes!